The evening settled in such a calm way on a late November walk with Blonde Two that it was almost tangible. It had been a still day anyway: so much so that I had commented how still the air was. As the day grew dimpsy I noticed that the air seemed to draw close and definitely feel different. It wasn’t that the birds had stopped; we hadn’t heard them all day. It wasn’t the wind dying down; there had been not even a breath of breeze. It was a strange thing but in terms of calming the mind and bringing a whole new sense of wellbeing, it was brilliant. 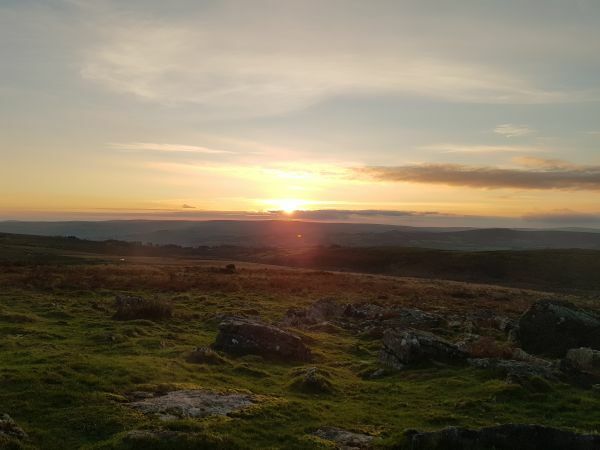 The benefits of getting outside and breathing fresh air are well documented but perhaps ‘taking the evening air’ can bring peace and tranquility to the mind and body a little better than any other time of day. Definitely worth doing a long term experiment I think. I understand what you are describing. I sense something similar on an early winter morning, say in Langdale. There is a nip of frost. The sky is blue. The air is sharp, silence prevails, but any sounds travel further than normal, perhaps the clunk of your footfall on the road, or the chink of your walking poles – a unique atmosphere which I wonder if other people recognise. If they haven’t experienced it then they’re missing out!